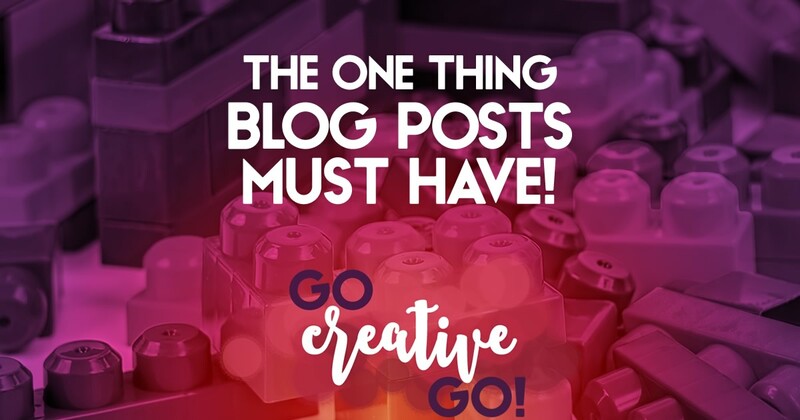 The ONE Thing Your Blog Posts Really MUST Have! I don’t know about you, but I’m getting a little tired of the useless “MUST” list articles being shared across our feeds on a consistent basis. 1. lacking brilliance or radiance; dull:lackluster eyes. 2. lacking liveliness, vitality, spirit, or enthusiasm: a lackluster performance. 3. a lack of brilliance or vitality. The last time I dissed the list, I was discussing the lists of “people to follow.” I still find those lists amusing at best, annoying at worst, as they rarely do more than list friends and continue to pander to “influencers” with whom the author is trying to get in good. Sure, there’s a small faction of newer, often called newbie bloggers, who might need a little help when it comes to the mechanics and structure of the post. But following a list and checking off boxes isn’t the secret sauce that takes dry and dull to delicious when it comes to publishing a post that will get read and shared. You’ve got to dig a bit deeper to deliver. Don’t Regurgitate, Deliver The GOODS! And what exactly are the goods? Y-O-U are the goods. All the things that make you uniquely and absolutely you. I know, that sounds pretty froufrou coming from me, especially when you’ve become used to my snark, sass and tell-it-like-it-is delivery. Don’t worry, that’s coming up! You aren’t sharing you when you regurgitate the same tired spiel that’s been rehashed, reborn, renewed and re-read over and over and OVER again. You’re sharing someone else, no matter how much you believe you’re adding your own unique spin and opinion. Would you like to know why many a list post is listless and lackluster? Of course you would! It’s because they’re pretty easy to churn out and they don’t necessarily require any conviction or sharing of deeper opinion. Especially when it’s a list you’ve already seen! Lists are often lazy! I know, I know, that goes against all the tips you’ve probably been seeing ten to fifteen times per day. Stop Rewriting And Dig Deeper! There’s nothing wrong with looking to your favorite bloggers and authors for inspiration. But inspiration often inspires the sad and same old regurgitation of what’s already been published, the already very well said and discussed. If you want to STAND OUT, you’ve got to take a STAND that matters to you and your audience. Lackluster list posts don’t stand, they lean on what’s already been done. And when you lean too long on others, you often lose what makes you strong, savvy and stand-out! That One Thing? It’s Y-O-U! The one thing your blog must have to succeed is an author willing to embrace and share their real self, in their own unique voice! If you can’t share what’s truly on your mind, you’re simply not going to engage with your audience in a real and unique way. No, it’s not easy. It’s taken me years to become truly comfortable with unleashing all of this snark and sass. I still, occasionally, second guess myself and seek permission to post some of my strongly personal and opinionated publishes. But you’ve got to let the real you shine through if you want to really connect. Your readers can smell subterfuge and insincerity from a mile away. Authenticity has been overused and abused, but if your publishes don’t reflect the real you and your real thoughts and ideas, you’re starting on a path that leads to pandering, which will leave your readers perplexed and less than passionate about your reads. I know what you’re going to say. It’s not about me, it’s about my audience. Puh-leeze. Spare me already. It’s another regurgitated phrase that many a savvy snarketer has argued for AND against. Yeah, you have to appeal to your audience. How do you do so? By being real. Being real is about being YOU! Catering to your audience and sharing the real you aren’t mutually exclusive. They go hand in hand, party peeps! I’m not going to stop delivering my take on that debate. But I am going to wrap it up for today. Are you ready to let the real you shine through? Definition of lackluster courtesy of dictionary.com. http://www.gocreativego.com/wp-content/uploads/2015/07/GCG-pinnable-must-have.jpg 1080 735 Mallie Hart http://www.gocreativego.com/wp-content/uploads/2016/07/GCG-sitelogo-new.png Mallie Hart2015-07-29 08:07:512016-10-11 11:34:30The ONE Thing Your Blog Posts Really MUST Have! You know we’re singing from the same hymn sheet here, miss – it’s all well and good putting advice out there, but if everyone followed the same template, how boring would that be? It’s be the Stepford Blogs, or something – hells no! We need to do our part, and find new blogs, and comment on them, and advise where they could have done something differently, and be constructive and supportive. It’s the only way to start countering all the generic crud that’s out there. I agree, Danny. But I think we have to take it a step further! We must stop sharing the listless and lackluster list posts, the regurgitated ramblings, if we want to stop the copy/paste cult. I don’t mean copy/paste as in out and out plagiarism, though we’ve both dealt with that. I’m talking about the copy/paste of the same tired ideas, trotted out on blogs big and small. Those ideas that weren’t original or thought provoking the first 712 times we saw them! I’m on board. I know you are, too. Now we just need to enlist a few others and we’ll have one helluv-an army! Funnily enough, I’m working (slowly, but surely) on a little project that might interest you on the front. Stay tuned! Intrigued! Tuned in, I shall be! And, before I forget, the little balls are the divider I use elsewhere in the site, but have never really used in my articles. Thought I’d add ’em for more visual appeal. I don’t think making them interactive is on the to-do list, though I know you’d love it. You did see my lurvely Click-to-Tweet art, right?